The CZ 2075 RAMI is the only metal subcompact gun that CZ makes based off of the CZ 75 design. This gun is made specifically for Concealed Carry. It has melted edges that are very smooth. It features snag free sights. 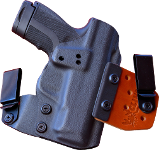 Concealed Carriers will also love the low profile slide release and thumb safety. The CZ RAMI is about the same size as a Glock 26 or XD Subcompact. The biggest difference is the metal frame the RAMI sports. The second most noticeable difference is that it’s hammer-fired rather than striker-fired. Because of its metal frame, it weighs 3 or 4 ounces more than a typical polymer subcompact handgun. The CZ is covered in the great Polycoat finish that CZ is known for. While the metal-framed CZ RAMI doesn’t kick as bad as a lighter subcompact gun, it still has some kick to it. The rubber grips help fight recoil a little too. Here’s another great feature to have in a Concealed Carry piece: reliability. Yep, the RAMI comes standard with great reliability right out of the box. Many love the ability to carry the RAMI cocked-and-locked the way a 1911 would be. Somewhat unique to the CZ, it can also be carried half-cocked which makes the first Double Action pull a little shorter. Here’s another cool feature that Glock fans love: Full Size CZ 75 mags are compatible with the CZ RAMI. Now that’s a nice feature for Concealed Carry. You can carry the smaller gun that prints less and weighs less. Yet, you can carry full size mags with a full load of 9mm ammo for reloads. The RAMI performs very well at the shooting range in the accuracy department. It’s easy to keep your lead in a tight pattern. It’s nice to have a Concealed Carry pistol that you can have fun with at the range. Clinger Holsters makes great CZ 2075 RAMI holsters to conceal your RAMI in as well.